We need to know an awful lot of stuff to be effective programmers. That isn't so incredible a claim, really. To be effective in any profession, you need to know a lot of stuff. But I don't know many other professions. I know how to be a programmer and what it entails, so that's what I'll focus on here. As programmers we need to know syntax, control flow, libraries, data structures, algorithms, design patterns, programming environments, paradigms, protocols, and good practices. That may be a long list, but it only scratches the surface. If we need to know so much to be effective, how can it be done? What are the most important things to learn to get started programming and to continue climbing the learning curve from wherever we happen to be? We want to figure out what topics are going to give us the most bang for our buck, and learn those things well. The rest of the knowledge we need to get the job done can be paged in as needed. One thing that has stuck with me since college came from the introduction to computer architecture course. Near the beginning of the course we explored the various types of historical computer architectures. They were generally classified into two groups—CISC and RISC architectures. CISC (Complex Instruction Set Computer) architectures tried to provide solutions to the programming interface with instructions that had lots of different options and did large amounts of work per instruction. RISC (Reduced Instruction Set Computer) architectures provided a set of primitive instructions that could more easily be linked together and used in different ways to achieve the same goal with possibly more, but simpler, instructions. Compiler writers found the RISC architectures much easier to work with because the simpler instructions could be combined in many more ways and used under a much wider variety of contexts than the more rigid CISC instructions. Computer architects also found the RISC architectures to be easier to design to, and they were able to more effectively implement microarchitectural features like branch prediction, pipelining, and out-of-order execution. RISC architectures ended up being better on both sides of the hardware-software interface, and over time the CISC processors died out and RISC processors took over. Even Intel's dominant x86 architecture, which started out as a CISC architecture, became more RISC-like over time, both in the types of instructions exposed in assembly language and how the instructions were translated into microcode for the pipeline to execute. RISC primitives were found to be much more useful for a wider variety of problems than pre-packaged CISC solutions, and they often led to higher-performance code. How does choosing primitives over solutions translate to software engineering? To answer that question, let's compare two languages—Java and C. I used to know Java. I used it for a number of classes in college. (I know that doesn't mean I really knew Java. I only used it incidentally and superfluously for some class projects.) I didn't experience the OO cathedral that Neil Sainsbury talked about in this post on why it's painful to work in Java for Android development, but I did get an early taste of it. If what he says is true, then the Java libraries have been built up into extensive frameworks that are trying to be solutions, and as was already noted, solutions have problems. When solutions grow in an attempt to address more and more of a problem space, they necessarily become more generic. They become less applicable to any particular problem because they have to increase their surface area to cover all of the issues related to other problems that are within the same domain. All of this extra configuration and layers of architecture make the frameworks more complicated and more difficult to use. As the libraries keep expanding in both number and size, no programmer is able to keep all of the details in their head and one's ability to understand the big picture of how to use a language and its libraries starts to plummet. At some point it's worth questioning if a framework is really adding value, or if you are spending as much time understanding the framework as you would spend building up a more targeted solution from simpler primitives. In contrast, C libraries exhibit the approach of supplying primitives for the programmer to use as building blocks. Heavy frameworks are much more rare in the C community, so primitives are used more often to solve problems. Of course, primitives have a number of problems of their own. It may take longer to implement a solution from primitives if a framework exists that is a good fit for the problem at hand. If you blindly use primitives without checking out what's available, you could be reinventing the wheel while recreating mistakes that have already been made and fixed in an available library, especially security or memory safety mistakes in the case of C.
Clearly, primitives shouldn't always be used when a better solution is available, but they do have a number of benefits that should be considered. In C you can hold nearly everything about the language and its standard library in your head. Once you learn the language and libraries, you're done. It's possible to pull those primitives from your working memory and use them efficiently without having to dig through mountains of documentation or relying on your IDE to constantly provide hints. You know how things work, and you have total control over what's happening in your application. This level of control allows you to cut out unnecessary cruft and maintain a highly optimized code base. Keep in mind that using primitives doesn't guarantee a clean, optimized code base. Nor does using large frameworks prevent it. In either case clean code requires diligence and skill to achieve, but if a framework doesn't fit the problem—if the framework is too large or poorly targeted—then using primitives is more likely to lead to a better solution. Also note that I'm not picking on Java or C here. 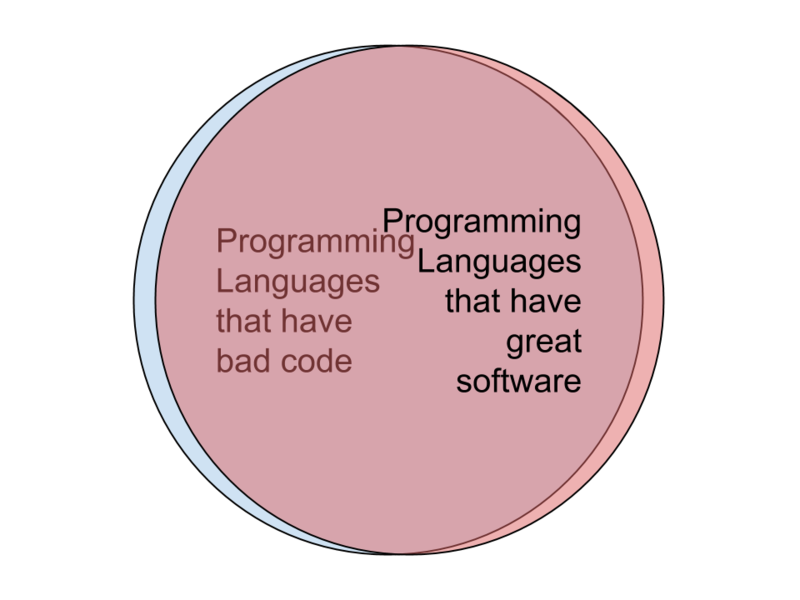 Both languages have their strong points and their drawbacks, and both work well for certain types of problems. They happen to exhibit certain tendencies in their libraries and frameworks that could as easily be shown by comparing C# and the .NET framework with Haskell or Ruby and its Gems with LISP. Remember, the best language doesn't exist. The point is that building up solutions from first principles can be better than trying to memorize a lot of heavy frameworks. Thoroughly learning the basics gives you a set of robust tools that you can use in a wide variety of situations. Knowing a certain amount of the basics is essential to being a good programmer, and the more you learn, the better you get. Learning a large framework is less beneficial because preferred frameworks change frequently, they're hard to memorize and understand completely, and worst of all, they don't teach you much about how to solve problems. They just give you the answers. Okay, if it's much more worthwhile to learn primitives, how do we learn them? In this post on what you need to know to function as a software engineer, (read it if you have time; it's long, but entertaining) Steve Yegge talks about the astonishingly large number of rules you need to memorize, and accumulating that knowledge takes a long time. As a result more experience yields better developers, in general. But memorizing everything is hard. Gaining enough experience to be effective purely through memorization would take more than a lifetime to accomplish. There must be a way to speed up this process. After all, we certainly know of great programmers that are only on their first lifetime. We need ways of linking these bits of programming knowledge together so that we can remember a much smaller set of basic things and derive the rest. The best way that I've found to ingrain this knowledge in my brain is to study and practice the basics enough to have a deeper understanding of why they are true and how they work together to solve problems. Separate fundamental ideas can fit together to form a coherent overall view of programming that makes it all easier to keep in your head. As an example, let's turn to mathematics, specifically the quadratic formula. It is certainly possible to memorize the quadratic formula, and a lot of people do. A lot of people also forget it, especially if they don't ever have to use it in their day job. I'm not arguing that everyone needs to know the quadratic equation, but it is actually fairly straightforward to derive it from a more basic principle, namely from completing the sum of squares. If you work out a few example second-order polynomial problems by completing the sum of squares and solving for x, you'll begin to notice a pattern in how the coefficients are manipulated to get to the answer. Once you see the pattern, it shouldn't be too hard to derive the quadratic formula on your own. When you understand completing the sum of squares well enough that you can derive the quadratic formula, you no longer have to worry about memorizing it. Next time you can figure it out again. Ironically, because you have that deeper understanding, you're also more likely to just remember it the next time you need it. The concept of the quadratic formula is resting on a solid foundation. It's a win-win. Mathematics is filled with examples of deriving higher-order results from first principles. The entire field is built on that idea. In the same way, most of the ideas in programming can be built up from simpler primitives. If you deeply understand the fundamentals of object-oriented programming, you can easily derive design patterns and understand when and where to use them instead of over-applying them. If you deeply understand pointers and program memory, you can derive most simple data structures, and then simple data structures lead to the more advanced data structures. If you deeply understand control structures and recursion, you can derive many different algorithms and better understand how they work. Understanding how these ideas are built on primitives makes them easier to remember and use effectively. The importance of fundamentals is probably why learning how to write a compiler is so instructive for programmers. Compilers use so many data structures, algorithms, and patterns that they're a one-stop shop for getting a deeper understanding of programming. While you're implementing a compiler, you're simultaneously learning how to use programming concepts effectively, exploring the underlying mechanics of a language at a deeper level, and discovering how the language interfaces with the lower-level machine, be it a virtual machine or a physical processor. You can't get more fundamental than that. Programmers often complain that learning basic data structures and algorithms is pointless, that those things are never used in day-to-day programming, but you never know when some low-level principle that you learned will come in handy. That may sound flippant, but it happens all the time. The more fundamental principles you know, the easier it is to brainstorm ideas that are likely to work. You can pull from a larger store of flexible primitives that can be pieced together to form a solution tailored to the problem at hand, and you may not even realize that you're doing it. Learning the basics trains your mind in abstract problem solving in a way that memorizing solutions won't. Sure, you don't need to know the fundamentals to get work done. Plenty of programmers put together working software from heavy frameworks and libraries that solve all of their problems for them. But those programmers probably don't understand the tradeoffs they're making or how the system they built really works. A programmer that does know how their code works and why things were done the way they were done is better equipped to handle the most difficult problems or the most complex features without making a total mess of the code base. Frameworks are certainly useful for solving a wide variety of design problems, but knowing the basics gives a programmer the wisdom to know when to use them and the confidence to roll a custom solution when necessary. To become a better programmer, start with knowing the basics. I've now had a 2013 Nissan Leaf for nearly 8 months, and temperatures here in Madison, WI have gone below zero, so I have a nice amount of data to share on this newer model. The 2013 Leaf S replaced the 2012 Leaf SL I had previously, and it includes a state-of-charge (SOC) percentage display on the dash that was lacking in the older models. This SOC reading is a major improvement to the unreliable GOM (Guess-O-Meter, or miles-to-fully-discharged meter) that I used before in my data collection. I haven't invested in any other kind of meter for measuring the Leaf's battery state because I wanted to treat the car more like a normal driver would. Measuring internal battery messages off of the car's CANbus was decidedly outside of normal driver behavior. I did purchase a P4460 Kill-A-Watt power meter for measuring the amount of electricity that is consumed by charging the car. The on-board energy efficiency meter doesn't take charging losses into account, and I wanted to know exactly how much electricity the car is using. I'll report on those numbers as well. Before getting into the numbers, I will say that I still greatly enjoy driving the Leaf. The 80kW electric motor is nice and torque-y, with zippy performance for around town and pleasing acceleration when jumping on the freeway. The power is especially evident when scaling steep hills, as the Leaf tears up inclines as if they aren't even there. And the ride is always smooth and super quiet. The handling so far this winter has been pretty good as well. The traction and stability control and the ABS all work when they need to, and the car's low center of gravity from the under-carriage mounted battery helps quite a bit, too. The one thing that could be improved in snow is the stock tires. They don't have the best traction, and the other safety systems have to compensate when the tires slip. I'll probably finish out the winter with them since the tread is still pretty new, but next winter I'm going to switch to snow tires. We're using winter tires on the Prius this year, and they've had an insignificant effect on mileage, so I expect the benefits of using them on the Leaf to greatly outweigh the minor range hit that I'll take. Collecting data on the Leaf was fairly straightforward. After every charging cycle, I would log the date, the charge percentage, and the accumulated kWh on the Kill-A-Watt meter. I nearly always charge to 80% unless I know I'm going on a long drive the next day. I was under the impression that the lower charge level was better for the battery. Although, I now hear that new Leafs will no longer have the 80% setting option. I'm not sure if that's because Nissan is trying to avoid consumer confusion, or because there really is no negative impact to the battery when charging to 100%. It seems reasonable that the latter could be true as long as the battery isn't charged until it gets below 80% SOC. The use case for a car battery is much different than for a laptop battery, where keeping it plugged in wears out the battery because it continually charges to 100% during use. After each drive I keep a record of the %SOC, the odometer reading, and the outside temperature as reported on the dash. I won't charge every night if I don't need to, and I often bring the battery down to 10-20% before charging. I don't normally go below that since there isn't much useful range left for me to get to work and back again at that point. I have a new job with a shorter 16-mile round-trip commute through town instead of my old 23-mile round-trip commute on the beltline, so I can now go three or four days between charges in the summer. There's probably a trade-off between less depth-of-charge and less charging cycles for better battery life, but I have no idea where the optimal point is so I go for less charging cycles. Once I have a good amount of data logged, I transfer it to Google Sheets to calculate range, average temperature, and miles/kWh. Estimating range is much easier with the %SOC numbers because all I have to do is subtract start and end odometer readings and divide by the %SOC used for those miles. I'm assuming that the miles/%SOC is linear for this calculation, but I'm not likely to push the limit to squeeze a few extra miles out of the battery at the end of the range, so assuming the same miles/%SOC over the entire range is acceptable to me. I'm still getting a reasonable estimate of range over many charging cycles. I calculate an average temperature for each charging cycle by taking the average of temperatures for each driving segment weighted by miles driven in each segment. Temperature has a big effect on range, so getting an accurate value amidst big Midwest temperature swings is important. I'm sure that the temperature during charging also has an effect, but I don't know how I would estimate this effect without monitoring temperature during every charging cycle. I'm not set up to do that so I ignore that effect. Besides, charging temperature is heavily correlated with driving temperature, even though the Leaf is always charging in a garage. The garage is unheated so it's always a milder form of the outside environment. The miles/kWh are calculated two ways. The car's measure of efficiency is recorded from the dash, and I let the meter run a measurement for a month before recording the value and resetting the meter. I also calculate the wall-to-wheels efficiency by dividing the miles travelled in a month by the kWh usage for that month from the Kill-A-Watt meter. I can then divide the wall-to-wheels value by the battery-to-wheels value to get an estimate of charging efficiency. That's how I collect and massage the data, so let's take a look at what we've got. What is the Real Range of a Leaf? It's an interactive chart so you can zoom and get info on specific points with the mouse. 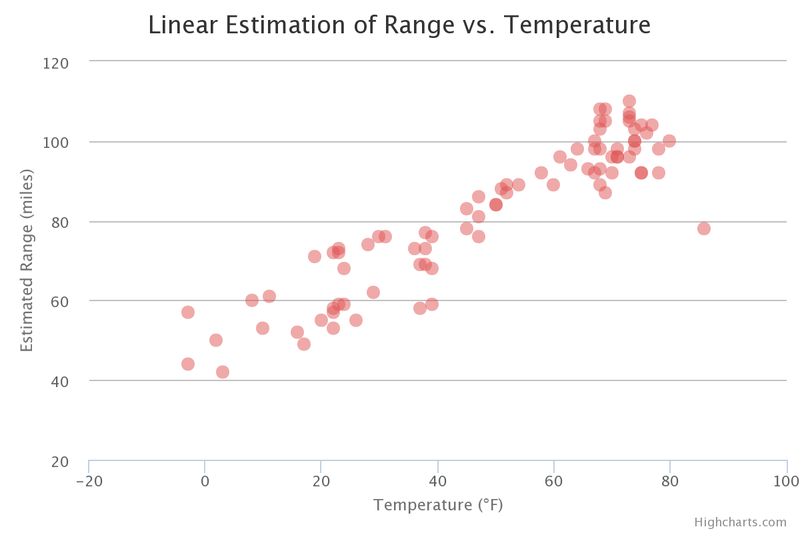 Clearly, temperature is the dominant effect, and the range is cut in half over the temperature range. While I was getting about 100 miles of range at 75°F, I am getting only about 50 miles at 0°F. Luckily, I don't have to drive far to work. This plot does include a mix of stop-and-go city driving and free-way driving at around 55 mph. I did take the Leaf on the interstate once at 65 mph, but only for a short while and it doesn't noticeably show in the chart. 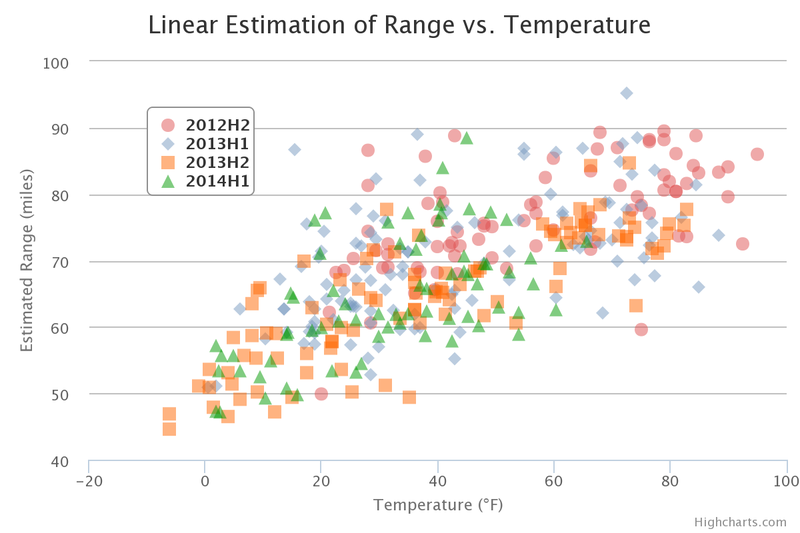 Two features to note in this chart are the outlier at 86°F and the wider variation in driving range at both ends of the temperature range, especially below 40°F. Regarding the outlier, this point happened to be a trip I took with the rest of the family to a high school graduation party. It was hot and raining so there was extra road resistance and I ran the A/C to keep everyone comfortable. The combination of extra weight, road resistance, and constant A/C resulted in about a 20% drop in range, which doesn't surprise me. The wider variation at the high temperature range is likely due to there being more data points over a wider range of driving conditions. Then as the temperature dropped in the fall, the points followed a more linear curve into the colder temperatures of winter. The main reason for the wide variation at cold temperatures is probably due to a number of reasons. Depending on temperature and humidity, I have to use the defroster more or less and sometimes I use the heated seats (although the seats don't seem to impact range much). If there's snow on the roads, that adds resistance and lowers efficiency. Lower temperatures happen to coincide with less daylight and inclement weather, so I use the headlights more and usage varies a bit more depending on the weather. Since I have normal headlights instead of the LED headlights that come as an option, they use more battery power. Finally, traffic varies more in the winter, and if I'm stuck in traffic, that amplifies all of the other losses, resulting in even more variation at cold temperatures. This plot has many more data points, but it still looks like it has much more variation than the 2013 Leaf data does. It will also be interesting to see if the 2013 Leaf maintains its approximately 100 mile range next summer, since that seems to be better than the 2012 Leaf was while the lower temperature ranges are roughly equivalent. 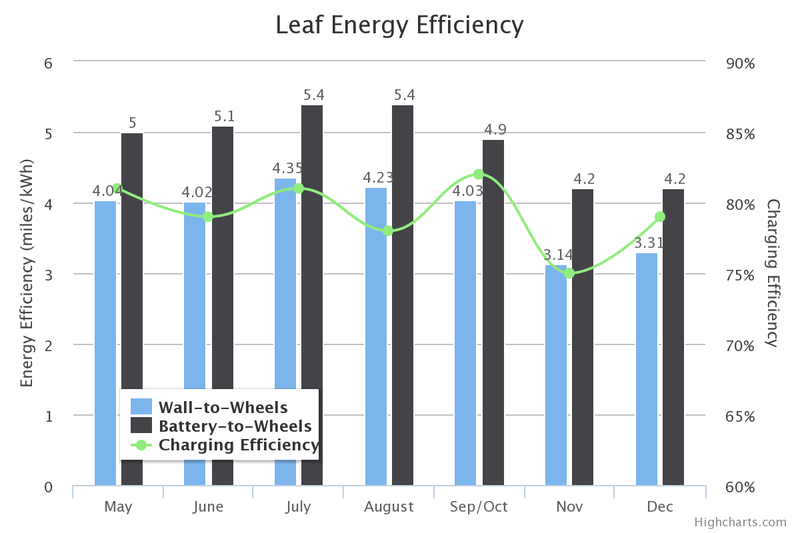 The regular headlights of the 2013 Leaf could be part of the reason for it not being more efficient than the 2012 Leaf in the winter. Overall, I'm quite happy with the data I'm getting from the 2013 Leaf. I'm a bit less enthusiastic about the steep drop in range over temperature, but when I compare it to our Prius, the change in efficiency is not all that different. We normally get 55+ mpg from the Prius in the summer, but on one of those bitter cold winter days I only got 28 mpg. The big difference with the Prius is that its normal range is about 500 miles on a full tank. Cutting that range in half still leaves plenty of range to get where you need to go. When EVs have 300+ mile ranges on a charge, it won't be as big of a deal when the range drops in the winter. This is the second most common question I get about the Leaf. So far I've driven 3,811 miles and measured 983 kWh of electricity use from the wall. With an electricity usage rate of $0.18/kWh, it's cost me $177 to drive that 3,811 miles. If I compare that to a car that gets 30 mpg, it would be like paying $1.39 for a gallon of gas. The price of gas has dropped quite a bit, but it hasn't dropped quite that far. Also, paying for electricity has the advantage of being a relatively fixed rate. It doesn't change nearly as much as the price of gas, and gas prices have been much higher in the past and probably will be higher in the future. The charging efficiency is easily calculated by dividing the wall-to-wheels efficiency by the battery-to-wheels efficiency, and it hovers around 80%, dropping slightly to 75% in November. I'm not quite sure why that happened. Another behavior that this chart shows is that the drop in energy efficiency does not fully explain the drop in range at lower temperatures. If that were the case, then the Leaf should have a range of about 80 miles in the winter, but I was averaging more like 60 miles for the last couple months. This discrepancy must mean that both the energy efficiency and the battery capacity drops with temperature. While the usable battery capacity is 19-20 kWh in the summer, it dropped to 15 kWh or less in the cold, accounting for about half of the range loss. Because of the range loss in the cold, the Leaf is definitely not the best car choice for everyone. If you live in a cold climate, you have to be careful to make sure you have enough range to get where you need to go or have a backup plan when the temperature drops too far. My commute is plenty short, so it works quite well for me. I love driving around in a smooth, fast, quiet car. I look forward to driving it everyday, and I couldn't imagine going back to an ICE car willingly. Once battery capacity catches up with our needs, we'll be looking to get out of our Prius and into a longer-range EV. In the mean time, I'll be enjoying the Leaf and will continue to collect data to see how it performs over time. It will be interesting to see what next summer brings. The complete code can be found at JSFiddle, where it's trivially easy to play around with different settings and see how the chart changes. The fact that they have all of this demo code posted at JSFiddle is great. I couldn't believe how easy it was to get this working. The experience was totally seamless. They also have excellent documentation on all of the chart options in an easy to browse format. Nice! The other neat thing about these charts is that you can click on the labels in the legend to toggle the data sets on and off—very useful when you have a lot of points, like in this chart. I'd say this chart is sufficient for the things I want to do, so this exercise has been a success. But what about other options? I haven't even looked at anything else. Chart.js - This looks like a simple, straight-forward library that allows you to create clean, elegant charts without a lot of extra cruft. It looks like it's a bit too simple for the features that I wanted, but if I wanted a no-frills chart that looked great, I'd definitely consider Chart.js. Google Charts - It looks like Google exposed the API for their chart creation feature in Google Sheets with this library. The documentation looks great, the charts are easily recognizable by anyone that uses Sheets, and they seem to be very fast. They also look to be quite fully featured with scatter plots and zoom capability. D3.js - This library is like the assembly language of charts. It gives you incredibly precise control over every aspect of charting, and it allows you to make all kinds of different charts beyond the basic bar/line/pie charts that most libraries offer. The flexibility of this library is readily apparent in this gallery of D3.js charts, and it's truly astounding. Unfortunately, I don't have the time to get good at something this complex. amCharts - Probably the most beautiful charts out of the box, amCharts is an extensive charting library that's as easy to use as Highcharts or Google Charts. There's also an online chart builder that looks pretty nice—kind of like a JSFiddle made specifically for their library. The library requires a license for commercial use and otherwise has an embedded link on every chart. There are many more options, but they all start to look alike after a while. I would have to use them extensively to ferret out more of the trade-offs, and I'm sure each one has situations where it would be the best choice. As it is, I'm quite happy with Highcharts. It was super easy to get up and running for this blog, and the documentation is so good that I can quickly find what I need, even if I'm only using the library a couple times a month. Who knows? Because of how easy it is to use, I might end up using it more than that. We shall see.